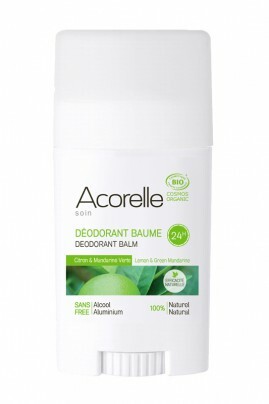 Discover the new Acorelle Deodorants Stick ! The Acorelle Vegan Deodorant Balm Stick with Lemon & Green Mandarine naturally and effectively neutralizes odor and wetness for a long lasting duration. Its composition is 100% natural, free of aluminium and alum-based. The Acorelle Vegan Deo Stick Balm respects the natural process of sweating, shea butter and coconut oil moizturize perfectly your skin. Its creamy texture is quickly absorbed and thus you can get dressed immediately after applying it. efficace, sent bon et pratique ! How to apply your ACORELLE Vegan Deodorant Stick with Lemon & Green Mandarine ? Protect your skin : Free of aluminium & Alum-based ! il sens très bon par contre je trouve que pour l' application il est trop sec du coup je doit frotter plus fort.